Lough Gur is one of ancient Ireland’s premiere archaeological sites with rich finds dating to all ages starting from the stone age, right through the bronze and iron ages and into early medieval times. 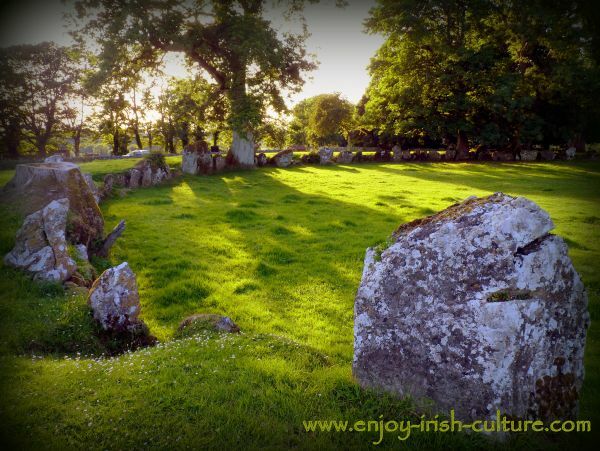 Meet ancient Ireland at Lough Gur. There have been several excavations in and around the lake starting from 1860 turning up a wealth of knowledge about ancient Ireland and early medieval times. Apart from excavated sites, a recent geophysical survey carried out by Rose Cleary of UCC’s archaeology department showed up many more sites which are not even visible on the surface. Findings of Neolithic settlements in the area date from excavations between 1936 and 1954. The settlements found were given a start date of around 4,000 BC. Archaeologists believe that the area was settled then for the first time. These early farming ad fishing communities would have been attracted by the plentiful natural resources- excellent farmland for cattle farming and growing cereals, excellent fishing as well as the right kind of rock for making their tools. Archaeological findings include the foundations of huts and houses as well as stone axes and other tools and field monuments such as cairns. 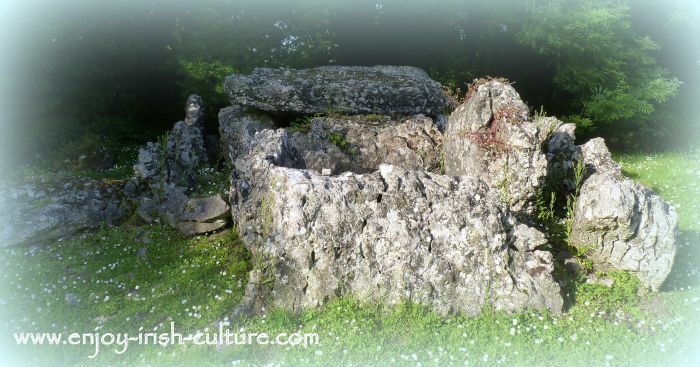 Wedge tomb at Lough Gur in County Limerick, Ireland. Bronze age finds include settlements at Knockadoon, burial sites and stone circles. 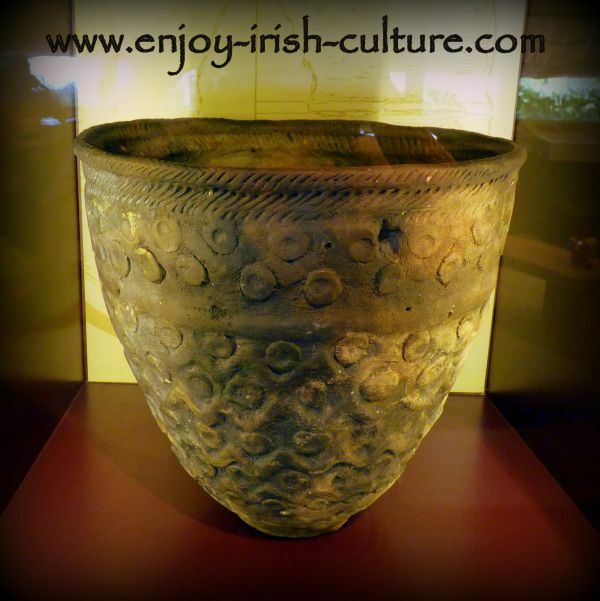 Around 2,000 BC the making of bronze tools and weapons started in Ireland, probably arriving here from abroad. Evidence of metal working was found in among the bronze age village on Knockadoon. Many bronze objects have been found in the area around the lake. To the bronze age culture who lived here, wet places such as bogs and lakes were sacred. They often used to ritually deposit precious objects there, such as special weapons and shields as an offering to their Gods. Replica of the Lough Gur bronze age shield. A stunning bronze age shield (above) was found here when the lake had been drained mid- 19th century and had brought many such objects to the surface. The priceless shield dates to 700 BC. It was discovered among rushes by local man Charles Hayes in 1972. He was working with a sickle at the time and accidentally pierced the shield in two places. Not realizing the significance of what he had found he sold it to a historian, Maurice Lenihan in Limerick for 30 Shillings who in turn sold it to the Royal Irish Academy for 50 Pounds Sterling, which was a lot of money in those days. The real deal is now located at the National Museum in Dublin. 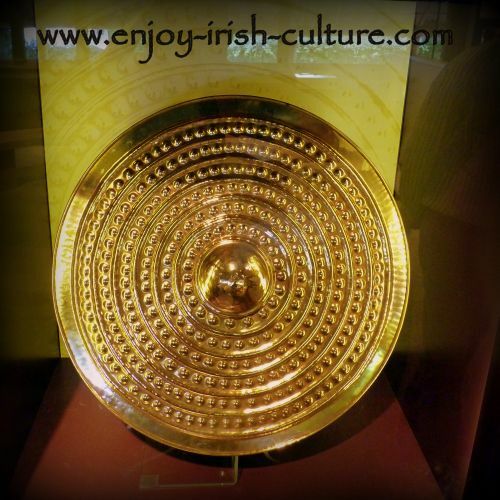 The visitors’ center at Lough Gur contains a well-made replica which looks as the shield might have looked in its hay day. Bronze is made by alloying copper and tin usually to a ratio of 9:1. The purpose of adding tin into the mix was to reduce the melting point for the copper. The alloying was done in a furnace where the copper ore and tin were distributed among the fuel and collected after the furnace had cooled down. The bronze was then washed and placed in a so called ‘crucible’, a ceramic container that would withstand the melting point of the bronze. The crucible was then heated until the bronze became liquid when it was poured into moulds. Moulds were made from rock by slicing and carving the desired shapes. Bronze has a low melting point and can be melted in a crucible over a bunsen burner. Bronze Age Pottery became quite widespread around the area from around 2,500 BC. This pottery was fired at low temperatures. It had very characteristic patterns. Vessels were often used as funerary urns. Knockfennel across the lake from the visitors center has yielded the remains of an iron age Celtic settlement- hut foundations and burial chamber along with the remains of now extinct brown bears in a cave on the hillside. A couple of medieval houses were found in the area of the car park during the late 1970ies by the Rose Cleary excavation here. The site called ‘The Spectacles’ is what remains of a medieval farmstead including the foundations of three houses and some ancient fields. The Boilin island crannog is considered early medieval, and so are the remains of two stone forts on the hill known as Carraig Aille. Excavations there have turned up beautiful jewellery made from glass, silver and bronze which was dated to the Viking era. 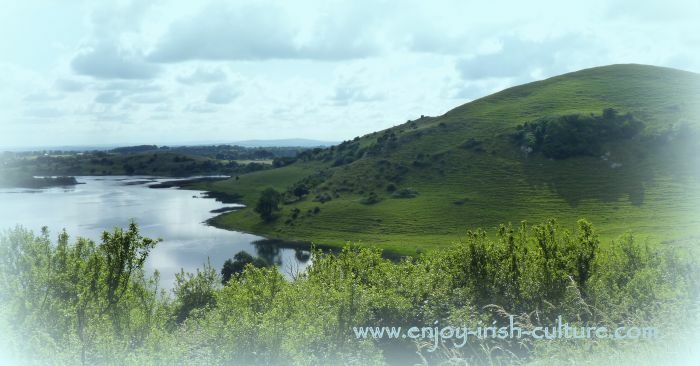 The first records about Lough Gur are in the Inishfallen Annals which were started by Irish monks in 1092 AD. Just beyond the car park on a private working farm, there is a medieval castle of national importance- the Desmond Castle. The castle gained a name for itself during a later episode in the history of Ireland- the Desmond Rebellion of 1569. 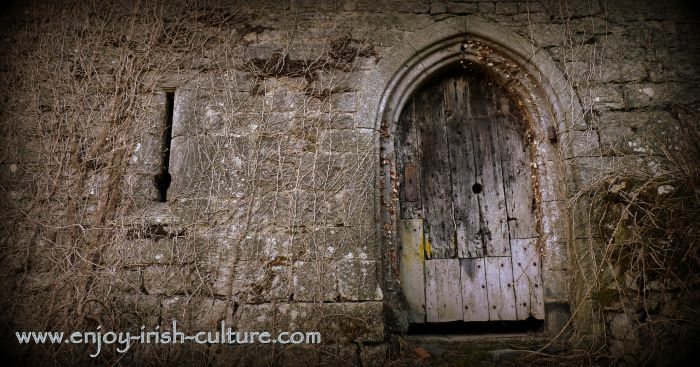 The door of the Desmond Castle, note the hole for muskets which would have been a 17th century add on. When Gerald Fitzgerald, the 10th Earl of Desmond, returned to the castle from imprisonment in England and Dublin having escaped, both he and his wife Eleanor wore the dress commonly worn by Irish chieftains- saffron robes. This was a symbolic act declaring his breaking with the Crown. Gerald would now join in the first Desmond Rebellion against Queen Elizabeth started by his relatives in his absence. 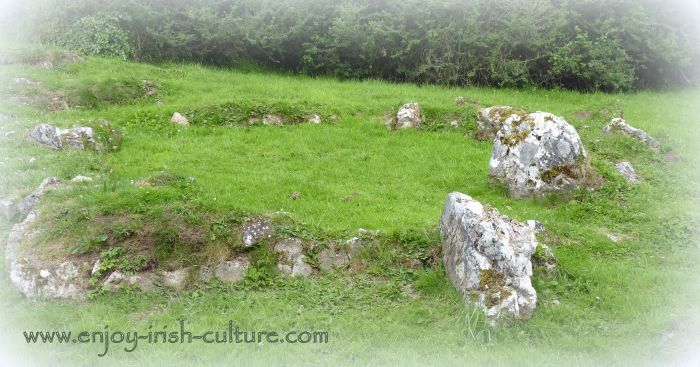 Find more details here at the website of the Lough Gur heritage center. We hope you enjoyed this article. If you like what we do on this website, how about telling your friends? Using the social functions provided here will help them to find our content, too! Just pick the social platform you like best, it's simple, look at the top left, and at the bottom. Thanks a million and warmest regards from Susanna and Colm.